The Navy recently got a step closer to getting the first ship in its new class of aircraft carriers ready for combat missions with a live-fire test off the coast of California. 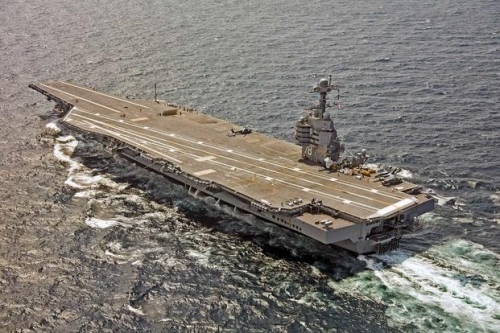 A drone was taken out by Raytheon's latest integrated combat system that�s being developed for the supercarrier Gerald R. Ford. The event took place on a test vessel off the coast of California, said Ian Davis, a Raytheon spokesman. The system the Navy used to take down the drone is called the Ship Self-Defense System. It integrates a myriad of equipment that will be used aboard the Navy�s first Ford-class carrier, such as sensors, missiles and radars. Raytheon program manager Mike Fabel said that the new system allowed for "seamless integration" when its sensors and missiles were put to the test. "This first-of-its-kind test proves the ability of the system to defend our sailors," Fabel said. "This integrated combat system success brings Ford [herself] one step closer to operational testing and deployment." At least five of the integrated-combat system's capabilities, which are also used on amphibious assault ships, were used during the live-fire event, according to a release detailing the test. That included a radar that searched for, tracked and illuminated the target; the Ship Self-Defense System, which processed the data and passed launch commands to the missile; and missiles that took out the targeted drone. The Ford, which is the first in its class of next-generation carriers, is expected to deploy in 2022. The first in the new generation of carriers, the flattop has faced a series of mechanical and technological setbacks. That has left lawmakers and the commander in chief pressing Navy officials to explain the issues, including those with the Electromagnetic Aircraft Launch System and advanced weapons elevators. The problems have even left some members of Congress reluctant to bless future multi-carrier purchases, a process that some say saves the service billions. Navy and Raytheon officials are planning to conduct more live-fire events this year as they continue putting the Ford's integrated combat system to the test.